I will make this quick and to the point. I have revised my popular Privacy and Asset Protection (Identity Theft Prevention) book that I originally wrote in 2003. This is my 3.0 version. It took me 35 years to research this material, 93 hours to write the book and 19 hours to revise and update this sage advice. There are a total of 69,820 words in this unusual 214 page book. You will not find this kind of a book at Barnes and Noble. If you are concerned about your family’s privacy and protecting your hard earned assets, this book is for you. I sell this book on my website for $69.00 as a hard copy and $29.00 as a download. My mentor (who died eight years ago at the age of 78) told me that each page of a book that you read represents 100 hours of research and thought to produce. In other words, you can save valuable time in your life learning from other people’s efforts to research and explain important information to you. This is like buying extra time for your life and benefiting from it simultaneously. Buy yourself some extra time by getting this book for you and your family…I promise that you will be glad you did. My wife said I was crazy. Why should we be concerned about privacy issues. Why should we go to all that “trouble” to protect our assets? We have more important things to do and think about…she said. This was 30 years ago when she said all that to me. Now, she says…I guess you really did know what you were talking about! All it takes is one lawsuit, one identity theft or one loss of your wallet and you take notice and change your priorities. Hopefully you are now learning how to protect your assets with one of my Land Trust products. However, there is a lot more for you to consider when it comes to Privacy and Asset Protection. Should you be more concerned about thieves breaking into your home or stealing your personal information? Think about this, if someone robs your home and takes most of your valuables you are insured most likely. However, if someone steals your identity they can potentially steal much more than just the value of your accounts! They can wreck your credit and even cause a warrant to be issued in your name! In a world of Facebooking, Tweeting, Blogging and online purchases, more and more personal information is being transferred around the world. While I cannot keep up with all of the HOT NEW sites, my method of privacy and asset protection will always apply to your every move. Think about those online accounts you keep. It may be a social network, online retailer or online banking. Now take a look at a list of your PERSONAL INFORMATION you may have floating around for anyone to see. DO YOU HAVE ANY OF THESE IN THE PUBLIC RECORDS? If you said yes, you REALLY need to read my Privacy and Asset Protection Book. You might even want to consider my Privacy and Asset Protection Home Study Course. “I want to have nice things and live financially comfortable” I AGREE! Nothing makes me more happy than to feel financially comfortable. It allows me to do all the things I want in life. OK SO WHAT DOES THAT HAVE TO DO WITH MY PRIVACY? YOU WILL LOSE IT ALL IF YOU DO NOT THINK AND ACT IN A PRIVATE MANNER. JUST ONE ID THEFT CAN DESTROY EVERY PART OF YOUR PERSONAL LIFE. Do not let your life be controlled by others. Take control of your identity today by reading my Privacy and Asset Protection Book and my Privacy and Asset Protection Home study course. I AM CHALLENGING YOU TO CHANGE YOUR WAYS! I know that change is difficult. If it were easy, everyone would do it and no one would have any problems. My grandmother told me, “anything worth doing will be difficult.” This may be a cynical attitude but, in this day with people who think the government should support them OR that they can get rich by suing those in our society that work hard…a little cynicism may be just what you need. I challenge you to change the way you think about your personal information, home address, social security number and more. It took me 35 years of research and 93 hours to write our Privacy and Asset Protection book. You will be amazed at it’s content. And what is really amazing is that I practice what I preach! This is how I have learned this information…by trial and error over 35 years. DOESN’T IT SEEM LIKE EVERYONE HAS “RIGHTS” EXCEPT YOU? We read the papers and watch the same TV news reports that you do. Aren’t you amazed at what is going on “out there?” Don’t you feel like everyone has “rights”, EXCEPT YOU? Why is that? Because of the blurring lines and even the definition of “right and wrong”. Our society has truly been “dumbed down.” Now you have to protect yourself from even the correct actions you take. Like it or not our legal system has run amok and you had better learn how to protect yourself…or lose (perhaps everything you own). A few years ago I attended a seminar for attorneys (I am not an attorney but was able to get invited anyway). It was an all day Saturday event. The whole purpose was to teach lawyers how to go after your assets! Can you imagine…there are full day seminars out there that teach attorneys how to take your assets away from you? Somewhere out there an attorney is trying to find a way to sue you and take your hard earned assets away. However, you may not be able to obtain many of the assets needed to further your wealth. What we are asking you to do is. If you go out socially you may want to tell your friends about the new house you just bought and how your job just gave you the big raise. Now you may look like the “cool guy” everyone wants to be, but you also become the “target” when others need an easy pay day. LOOSE LIPS SINK SHIPS… KEEP THE TARGET OFF YOUR BACK! As you continue to read my Privacy and Asset Protection Book, you will start to understand how to EASILY move the target off of your back. Please read my book to understand exactly what we I am talking about. I really am concerned about your personal privacy. Do not let your life be controlled by deadbeats and lawyers. 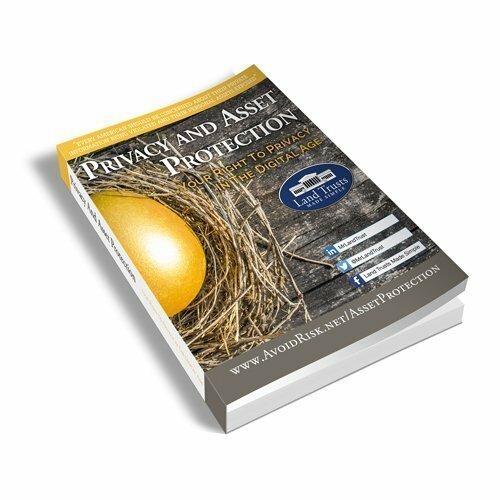 Take control of your identity today by reading our Privacy and Asset Protection Book. My book is 180 pages of real life practical advice from an investor that has been in the trenches for 40+ years. DOES EVERYONE DESERVE TO COLLECT YOUR PRIVATE INFO? NO, however you would think with everyone asking for private info… it must be required? You have the option of NOT giving out your private information. TURN AROUND! WHO IS THAT LOOKING OVER YOUR SHOULDER? There are Prying Eyes everywhere you go. While you are driving, eating out, using your credit or debit card, working, or enjoying your favorite recreational event. If you give off the “vibe” of having it all, people will take notice. If you do not follow my “philosophy of privacy” you should become very concerned about who is watching you! Do not let your life be controlled by the security of others. Take control of your identity today by reading my Privacy and Asset Protection Home study course. IT WILL MAKE YOU RETHINK EVERY TIME YOU GIVE OUT YOUR PERSONAL INFORMATION OR SIGN A DOCUMENT. – How Can You Protect Yourself from These Breaches? It’s Not Crazy if They Really Are After You! How Do You Find a Good Lawyer? – The Real Interrogation Specialist! – Change Your Opinion of The IRS – For the Worse! – How Does the Con Work? – Who is a Con? – Who is a Potential Victim? – Anyone Can Get this Type of Informaiton? Its Not Illegal? Take your Privacy and Asset Protection to the next level with my 177 page Home Study Course. Not only can you learn about Asset Protection but now you can put it to practice!